I want to play your cancelled video game. Not just that, but I believe I speak for countless other robot combat fans, young and old alike, when I also say we want to play your cancelled video game. On September 12th, 2002 BattleBots announced on their official website (the archaic weird desert camouflage-colored one) they had secured a deal with THQ to publish a video game for the PlayStation 2 and GameCube video game consoles. The game, titled simply “BattleBots”, was to be developed by Majesco and released two months later in November in time for the holiday season. Unfortunately, this did not happen. The deadline passed and the BattleBots store updated their preorder information to reflect a new release date of February 2003. This too passed, resulting in yet another delay this time to May 2003. May 2003 came and went without the release of the game, just in case you can’t see the pattern yet. BattleBots’ fifth season on Comedy Central had long since ended by this point; the show was not renewed for another season and, unknown to the BattleBots organizers at the time, would remain off the air for thirteen years. 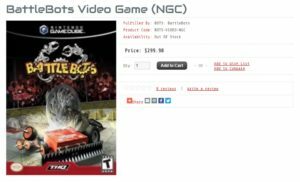 Public interest in BattleBots and robot combat in general began to wane and the BattleBots video game for PS2 and GameCube was shelved indefinitely with no further release date extensions provided. On February 25th 2003, Infogrames’ Robot Arena 2: Design & Destroy was released for PC. It would be the last robot combat simulation game released in North America for over a decade. In 2010, THQ, the would-be publisher of the BattleBots game, had the bright idea to release a stupid drawing tablet for the Nintendo Wii, Xbox 360, & PlayStation 3. This abysmal piece of junk would be their last major move as a company; the uDraw was the straw that broke the camel’s back and in November 2012 THQ filed for bankruptcy. Their final stand was a partnership with — of all things — Humble Bundle to try and raise funds to help them pay off a $50 million loan. On January 23, 2013, THQ closed its doors for good. But that’s not where this story ends. This game exists. Somewhere. THQ is dead and gone, but their license rights to BattleBots didn’t just vanish into thin air. When companies die, everyone else crowds in like hungry vultures to devour the carcass, ripping it to shreds and running off with whatever they can get. Somewhere in this bloodfest, whether they know it or not, someone obtained the rights to this game. Sitting in some filing cabinet in god knows where is a piece of paper that states who gets to call the shots on this game’s code… and likely its release. 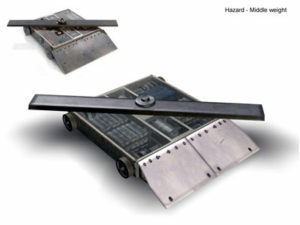 It’s widely known that a playable demo of the game was on display at the “BattleBots 5.0” event back when the show was still on Comedy Central. I’ve spoken to countless builders, drivers, team members, and fans who were at the event and got to try it out. 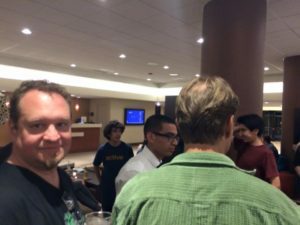 I’ve also tracked down people who own legitimate copies of the prototype itself and chatted them up about it just to collect as much information as possible about this game. I’ve meticulously followed this game for 14 years and can tell you with complete sincerity, corroborated by multiple people, that it’s pretty much “done”. It’s absolutely playable and most of the remaining work that needs to be finished is rebalancing the stats and weapon efficiencies of the various prebuilt/licensed robots in the game. The playable BattleBots prototype itself still covertly makes its rounds to this very day; in 2015 Donald Hutson of Team Mutant Robots famously brought the prototype and all of the special equipment necessary to play it with him to the event… and apparently pissed off hotel security when he plugged it into their lobby television for people to try out. Furthermore, in April 2016 an anonymous fan posted unsubstantiated “evidence” of their ownership of the prototype to the robot combat community GameTechMods. We live in a day and age where relics of yesteryear are coming back into the public spotlight with resounding success. Among the reboots is of course BattleBots themselves, who’ve managed to swing not just one but two seasons on ABC. That’s Disney’s money that they’re playing with now, and Disney is loaded. With BattleBots’ resurgence in popularity, right now is the best time to figure out where this lost video game has ended up, finish it, and give it the proper release it was denied all those years ago. Sure, it might not have Tombstone and Bite Force and Bronco and all that, but this game was basically complete when it was cancelled; it’s a sure win as long as it’s framed as a “classic” and marketed accordingly. Vintage and classic games are so en vogue right now that there are entire companies, such as ZOOM Platform and Good Old Games, who focus only on re-releasing old video games on modern platforms with updated hardware. Would a video game based upon the BattleBots of today be feasible? I don’t know, so why don’t we convince the guys in charge to use their legacy game as an immediate barometer for potential sales of a future title? I’d buy a copy, and chances are you — the person reading this open letter — would buy a copy too. But is there interest in a robot combat game in 2016? Absolutely. Robot Arena III, the follow-up to the aforementioned Robot Arena: Design & Destroy, was released in May 2016 following months of hype on social media. Sadly, the game was released in what many claimed was an “incomplete state” and became a critical failure; Robot Arena III currently maintains a review score of “Mostly Negative” (66% negative as of this article’s publication) on the PC gaming platform Steam where the majority of the game’s “positive” reviews were left by players hopeful that the developers would fix it. Even though Robot Arena III was for all intents and purposes a failure, the game’s release showed that there was (and still is) massive demand for a robot combat video game. When BattleBots made their comeback in 2015 they added a bunch of “vintage merchandise” to their online store in its own separate category, including the cancelled video game which as I’d eventually discover had been added erroneously and wasn’t actually for sale. They were asking $300 for it. I straight up offered to buy it for that price, despite how insanely high it is, because It’s an invaluable piece of robot combat history. To be honest, I had set aside a maximum of $1,000 to purchase this game on the off chance that the opportunity ever arose, so while $300 might seem insane it was a steal to me! And I’m not the only one, either. Several fans came forward both on the /r/battlebots Reddit page as well as the robot combat Facebook group to discuss the potentiality of this game actually being available in some tangible form. In late 2015, after BattleBots’ first season on ABC had ended, there was a minor resurgence of interest in the game because so many new fans were getting acclimated to the sport and wanted to know if there was a video game where they could get behind the controls of a bot of their own. There isn’t, but there could be. Greg, Trey. 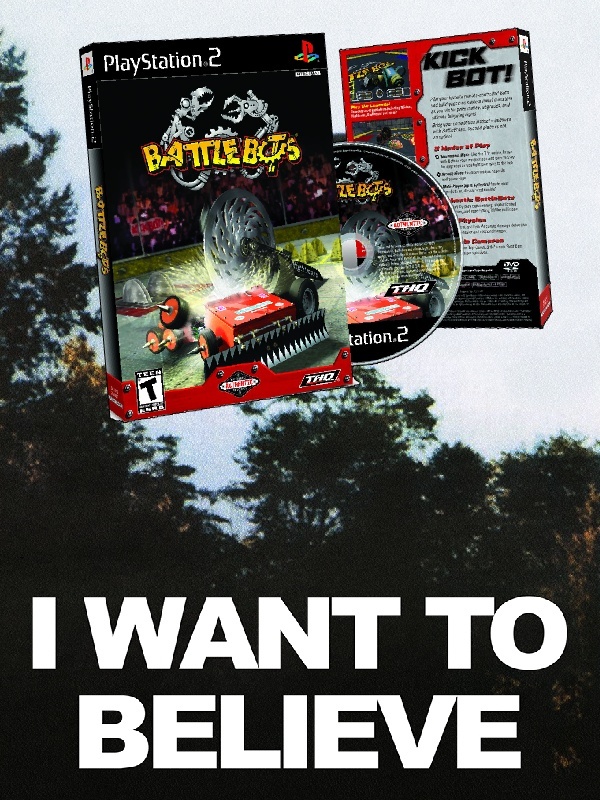 I know you guys read this blog and follow the community, because BattleBots recently teased a “Throwback Thursday” picture of the game’s concept box art that I personally dug up and posted to Reddit. I know you’re both as invested in this community as much as me and every single other person who’s ever seen a BattleBots event and thought to themselves that it was one of the greatest things they’ve ever seen. Seventeen years ago I remember watching BattleBots on Pay-Per-View at my parent’s house and I knew right then and there that this was something that would stick with me for the rest of my life, and I am certain I’m not the only person who feels this way. However, never in a million years did I think I’d ever have the platform I have right now to reach out and connect with literally hundreds of fans of the sport. As the blindsided and largely unprepared chairman behind this platform I know it’s my duty and obligation to bring this subject to light to the best of my abilities. People love BattleBots, people want this game; you have fans, including myself, asking you for copies who are more than willing to pay three hundred dollars for it. Imagine with a proper release not just what it could do for you, but for the newly reinvigorated community as a whole. You’ve got the TV deal with ABC, you’ve got the toy deal with Hexbug/VEX, now all you need is the video game to complete the act. BattleBots Update is not affiliated with BattleBots, Inc. or their partners. BattleBots Update is an independent comedy website. “BattleBots” and the BattleBots logo are registered trademarks of BattleBots, Inc. and appear here in accordance with their usage terms. Twilight Foundry (established 2001) is a multimedia production group that specializes in vintage gaming, pop culture nostalgia, and live streaming. They have also been building and competing in robot combat events since the turn of the millennium.